I enjoy a decent meal at a local restaurant as the next person. However, the costs are rising and with this economy, it's just not feasible to dine on our budget very often. Due to this, I stalk the aisles and shelves at our local grocer and try to persuade my picky family to embrace new meal ideas. Generally, I cook a full meal nightly for my family and I like a variety. Not only do we enjoy a variety, we are learning to enjoy healthier and more wholesome meals at the dinner table. The ingredients in these kits help provide me with the satisfaction that I am feeding my family a healthier meal. Good Earth dinner kits are made with 100% whole grain, no trans fat, no artificial flavors, no artificial preservatives, no MSG ! The meals are also flavorful and simple to prepare in 30 minutes or less. The only ingredient you need to provide is the meat, olive oil, water, milk (Mediterranean Chicken) and a place to sit down to savor the flavors with good conversations. 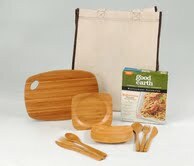 MyBlogSpark and Good Earth provided me with a Good Earth Mediterranean Chicken dry dinner kit, two sets of bamboo flatware, two bamboo dishes, a bamboo utility board and a 100% recyclable grocery tote and would like to give one of these kits to one of my readers. Which Good Earth dinner kit are you most eager to try? Disclaimer: I simply received the Good Earth Gift pack from Good Earth & Myblogspark and have posted my own, personal and unbiased opinions. I hold no responsibility between you and the company, and/or products you may purchase or receive from them. I would like to try the spicy citrus glazed shrimp with angel hair pasta. I'm eager to try the Herb Crusted Chicken with mushroom risotto. That would be the spicy citrus glazed shrimp with the angel hair pasta. I want to try the Spicy Citrus Glazed Shrimp with angel hair pasta. I am eager to try the herb crusted chicken with mushroom risotto. The Herb Crusted Chicken with mushroom risotto sounds yummy! Google Friend Connect - Heidi V.
I'd love to try the Spicy Citrus Glazed Shrimp with angel hair pasta! My family would like the Tuscan Chicken with Penne Pasta. The grandkids will eat just about anything as long as there is penne pasta on their plate. Tuscan Chicken! Thanks for the giveaway. I'd definitely like to try the tuscan chicken. They all sound tasty, but I'd love to try the Spicy Citrus Glazed Shrimp with angel hair pasta in particular! Thanks for the chance to win! and entry #5 for following you via google friend connect! My first choice would be Spicy Citrus Glazed Shrimp with angel hair pasta. Mmmm! I would love to try the Mediterranean Chicken with angel hair pasta!!! I follow you on Twitter as EFandFrugal and Tweet! I would love to try the Tuscan Chicken with penne pasta, thanks! I'd love to try the spicy shrimp. I would love to try the Tuscan Chicken with Penne pasta. Thanks for the giveaway! #1 I'm following you through google friend connect as valancia. #2 I'm following you through google friend connect as valancia. #3 I'm following you through google friend connect as valancia. #4 I'm following you through google friend connect as valancia. #5 I'm following you through google friend connect as valancia. The Herb Crusted Chicken With Mushroom Risotto would be my item of choice! I would love to try the Spicy Citrus Glazed Shrimp with angel hair pasta. It looks great and it is always nice to try something new-especially a shrimp meal! 1.Follow my blog on Google friend connect -carol lewis. 2 Follow my blog on Google friend connect -carol lewis. 3 Follow my blog on Google friend connect -carol lewis. 4 Follow my blog on Google friend connect -carol lewis. 5Follow my blog on Google friend connect -carol lewis. I want to try the Tuscan Chicken with penne pasta.